These are some answers to Frequently Asked Question's received about Campaign Builder. Q. How do I use a Campaign to automatically filter Contacts who have NOT opened any message in x days? A. Refer to this Q&A with step-by-step instructions on how to setup this type of Campaign. Q. What do I do with the "Added to Campaign" element? A. The added to Campaign element exists on every Campaign map. This element is what allows you to manually add a contact to a Campaign and cannot be deleted. Depending on your needs, there are 3 primary options that we recommend placing below the Added to Campaign element. If a contact is added to a Campaign, the contact will proceed down the elements below the Add to Campaign element. Use a Go To filter element. If you plan on adding contacts to the Campaign via contact Group action or manually from a contact record, you can add a Go To filter element below the added to Campaign element and lead the Go To arrow to the element the contact should receive first (an alternative solution would be to create a Trigger specifically for that purpose). 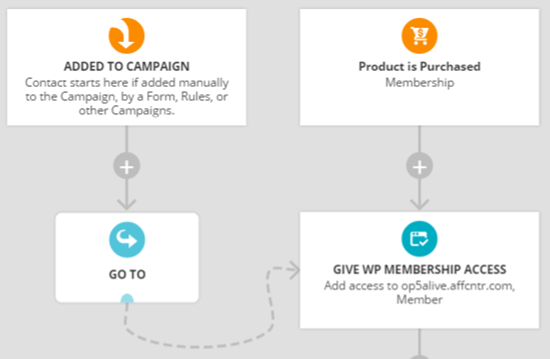 In the example below, if you wanted to give a contact membership access without logging a product purchase, you could add the contact to this Campaign and it would automatically fire all of the actions to give Wordpress membership access and send an email with their username and password (not shown in image). If the only way that contacts will be added to the map is by Triggers that are activated or Goals that get achieved, place an End below the added to Campaign element. 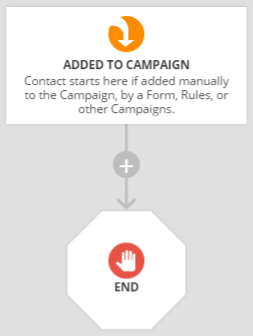 If you have Campaigns where you are using the Add to Campaign option on forms or in rules, do NOT add an End element below the added to Campaign element. Otherwise, the contact will get added and stop there. Q. How long is a 1 day wait? A. Each day is a full 24 hours. If the Contact reaches the Wait element at 10:30 AM, and the Wait is configured to "Wait 1 day and then wait until 10 AM" the Wait will pause the Contact for a full 24 hours, until 10:30 AM the next day, and then wait until 10 AM is next seen (the following day). Q. What happens if I change a Wait element with contacts on it? A. Let's say your contacts are currently sitting on a "Wait" element that has been set to 3 days, but you'd like to change it to wait 5 days. After making the change, the contacts currently sitting on the "Wait" element will sit for a total of 5 days, not 5 more days from when the change was made. Likewise, if the Wait is set for 3 days and you change it to 1 day, those Contacts that have been on the Wait element at least 24 hours will proceed to the next element. Those that were just added 12 hours ago will wait another 12 hours until the 24 hour period is finished, and then progress to the next element. Q. What happens if I delete an element with contacts on it? A. The contacts are removed from the campaign along with the element when you re-publish the campaign. If you want to retain them on the Campaign use a "magnet" Goal or Trigger that acts when a Tag is added to the contacts (select it to work for contacts "only on this campaign" and "move them here when triggered"). Then, publish the campaign. Open it in the default Performance Mode where you can see the number of contacts on each element. Click the number above here now on the campaign element you want to delete and use a Group Action to add the Tag to that Group of contacts. The contacts will be moved off that element and onto the magnet Goal or Trigger. You can then safely delete the (now empty) element. Q. How can I print a Campaign on one page? A. On a PC, hold down ALT while clicking the printer icon. The print preview will be opened in a new window with the campaign on one page. On a Mac, press Option and click the printer icon. Clicking the icon without holding down ALT or Option formats the campaign into 8.5 x 11 inch format, tiling the pages from left to right, top to bottom. Q. If I pause a contact on a Campaign that is a child of another Campaign, do they go back to the parent Campaign? A. When you add a contact to a campaign from another campaign, a Goal or Trigger that applies to all contacts will remove them from that nested campaign. However, in the absence of a Goal or Trigger, a contact on a nested campaign that is paused will remain paused on that campaign until unpaused.